Combine apricot jam, vinegar and Sriracha. Then bring to the boil and simmer until reduced by a third and thickened. Cut the chicken wings into two parts, the winget and the drummet then season generously with salt and pepper. Toss each wing into corn flour, then tap off the excess. Deep fry in hot oil until golden and the wings are cooked through. Drain on kitchen paper then place into a shallow bowl, drizzle over enough sauce to coat the wings. 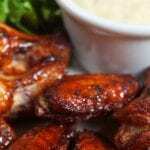 Serve wings immediately with any extra sauce as dip and some traditional potato salad on the side.